Young Writers Anonymous | Does anyone have what it takes to break into writing? I was really excited to read Lev Grossman’s series because I’d heard it was like a “Dirty Harry Potter” and as a thorough Harry Potter nerd, I really looked forward to passing my judgement. 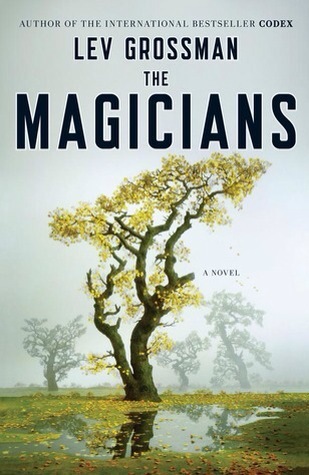 Outside of a few joking references, though, The Magicians has nothing to do with Potter, but a lot to do with The Chronicles of Narnia. Grossman was clearly creating a Narnia spoof, and with good reason, but I couldn’t help but feel like he didn’t actually get to the plot until maybe the last 150 pages of a 400 page book. The protagonist, Quentin, gets invited to a magic college early on, but then we spend the entirety of the first half of the book learning next to nothing about Quentin’s school, but rather passing his way through time through a series of large time-gaps and exposition. Characters are plucked from nothingness only to be tossed back in (and occasionally repeating the process). It was as though Grossman had gotten the idea into his head of a magic college and then married the idea when, in fact, the college had almost no significance to where the story was going other than that they thereafter (and somewhat feebly even) knew magic. I’m not even sure why the first half of this book exists. Basically, the first half of this book is prolonged exposition scattered with a smattering of actual scenes that seem to take on no real significance. What is the point of Welters? for instance. Or the whole South Pole thing? If you’re looking for a book about a magic school, this is not it. You get very little from Q’s time there. The strongest point of this book is definitely the coming of age aspect, which I felt didn’t really shape up until quite late as well. Quentin, of course, has a lot of growing up to do. I like that Grossman puts his character through the ringer, that he has him make almost catastrophic mistakes, that his personal life is in shambles. I’m tired of this genre of writing having everything work out so perfectly. Quentin’s life gets messy and not everything goes well. That’s a hard lesson for him to learn, but a lesson so quickly left out of Young/New Adult literature. I definitely enjoyed that theme abutting the Narnia-spoof. Honestly, I didn’t love this book. By the time we FINALLY get to Fillroy (the Narnia-esque land), it’s a bit rushed to me. I hated most of Quentin’s friends. I hated the way Grossman tossed around characters, the way I always seemed to know less about the character’s lives than what was happening, and–most of all–I hated all the exposition. Is it so wrong to want to be in a story, rather than hearing about a story? But I did like the adult themes, the way he clearly dirties up a typically innocent cannon, the way he could create issues out of one’s grasp. But honestly, I didn’t get into it until the end. It was hard slugging for a long time there, waiting merely for the inevitable Fillroy plot to finally manifest. I’m probably not going to be reading on, albeit I’m a bit curious and angry about a curveball that’s mentioned entirely without comment, as if it’s perfectly usual, at the end. Seriously? Where did Julia just come from? YOU CAN’T JUST DO THAT! 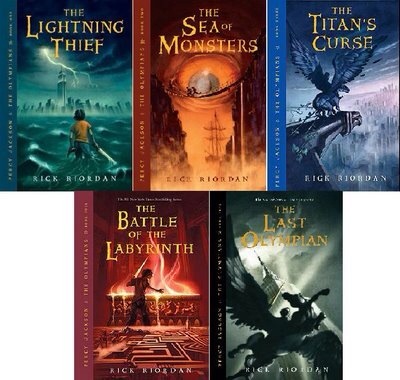 In my quest for entertaining Young Adult and Middle Grade fiction, it was only natural that I would feel compelled to read the Percy Jackson series. Probably one of the most successful series since Harry Potter, there isn’t a household of school-aged children I enter that doesn’t have a copy of this series. While an enjoyable take on Greek mythology, modernized, and an entertaining, action-packed read, I wouldn’t say this series will change your life or anything. It’s cute. Percy is endearing, but it lacks any enduring philosophy for future generations. Annabeth, Percy’s best friend, is a little bit annoying, if not overly-unrealistically-intelligent, I sometimes found her a little too perfect to buy. Her role in the final book, The Last Olympian, is a little bit frustrating, if not downright sad. Why make apoint of making this girl so great, only to turn her into somewhat of a moody brat in the last book? I know Riordan was aiming for a bit of a jealousy aspect, (why do we always have to have a love triangle?!) but I couldn’t help but feel it was all a bit contrived. I think the part of this series that frustrated me the most was the strange way time is spaced between each book in the series. Sometimes Riordan picks up again in the strangest spots so that I can’t help but feel like I’ve missed something (and perhaps I have, Riordan produced a strange array of marketable work to promote the movie franchise. Sad to see that interfere with his work, but who can blame him? It’s the business). I felt like, at the beginning of almost every book, I had no idea where or what we had suddenly just picked up. But Percy himself is redeemable enough for the whole series. He’s clueless and somewhat dim-witted, but he’s exactly what I’d expect from the narrative of a Greek hero. A lot of courage, and very little understanding. Some of his quips are pretty sweet, funny in almost a laugh-out-loud way. If I were still 14 I would definitely have had a little crush on him. He’s a good kid and a great role-model sort of character. So I grabbed Phan’s collection of linked short stories off a shelf at my favorite used book store in New Orleans (she’s the director of my writing program so I felt I needed to read it before classes began) and carried it around with me for a month before I could finally bring myself to read it. Something about it just seemed like it would be a painful read, but I was surprised to learn the opposite. Each story was fluid, gliding into each other and these people’s lives. 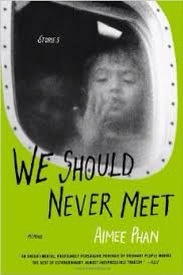 Set both during and in the aftermath of the Vietnam War, the book explores, through various persons related to the event, Operation Babylift (an American intervention to immigrate orphans left in the wake of the war–mainly those children with American parentage) and the lives of the orphans related to it as they grew up in America. So clearly this was going to be a fraught topic: babies, war, American foster system and orphans. It’s a rough subject, but Phan doesn’t make things too wrenching. She isn’t trying to punish the reader, but rather give them this brief glance into the window of those affected’s lives. I think, though, despite Phan’s seamless writing style, I couldn’t bring myself to love this book. She builds some frighteningly tense situations (the scene with Bac and Vinh in “Visitors” is wrenching) and then, at the last minute–right before the climax, takes you out of them. I felt a bit cheated to never hear the end of Bridget’s story, only left to assume the worst of her. The final story was, to me, the most flat and a bit of a bitter note to end on. And as for the various characters left behind in Vietnam, I craved more knowledge of their lives. What happened to them in the war. The worst is the terribly vague opening, effective in what it never says, but I felt most connected to Nan and then you never even learn the details of her situation and she’s never heard from again. Overall, it’s a fast read with an interesting, lesser-known perspective on the Vietnam War. Worth a read, you may learn something, but overall, it won’t be replacing any favorites on the shelf.